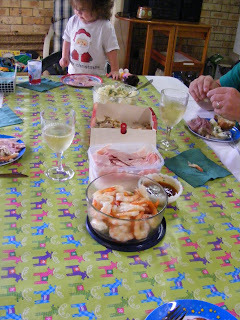 Lunch this year will look much the same - cooked, cold prawns and dipping sauce (I love a coriander/sweet chilli dipping sauce, Steve loves Neil Perry's garlic & lime aioli), ham off the bone (must remember to buy one tomorrow), cold chicken (I usually pick it up from Red Rooster, this year we are debating about whether or not to do that again, or just buy a couple of chooks from the supermarket - I'm partial to the warm, fresh chicken on Christmas day, and don't mind driving to pick it up), and potato salad, made the day before. Followed by meringue nests with cream and fruit salad on top. Christmas dinner (tea) will be a turkey breast roast (already in the freezer), roast veg and potatoes, followed by sticky date pudding with butterscotch sauce. Quite an indulgent day all round. What will you be eating on Friday?